British design, world influences, and a distinct Costa Rican beach setting come together in this airy, 3-bedroom family home in Las Catalinas, where you can spend some quality time with your loved ones or entertain guests while overlooking the beautiful almond and ylang ylang trees of Plaza Carlota. This Guanacaste beach apartment offers comfort, privacy, and a genuine sense of a home away from home, just a couple of minutes’ walk from Danta Beach. 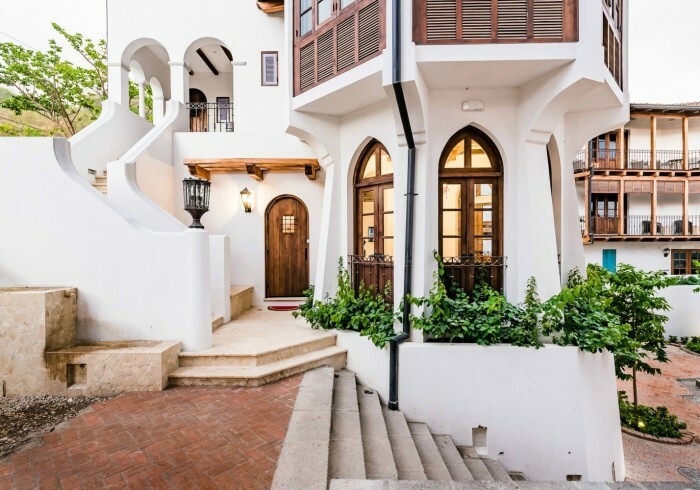 If the colonial exterior of this vacation apartment in Las Catalinas is stunning, its integrated interior living spaces are a delightful surprise. The owner’s London origins and many travels influence everything from the world atlas in the kitchen to the different sitting and dining options, with eclectic ideas, playful touches, and unexpected notes of color. And yet, it all works. These traits are shared with the sleeping spaces, where chic simplicity meets sophisticated color variations, whether in its distinctly British Master Bedroom, with an ensuite bathroom and an open door to the lush dry forest of Las Catalinas, or in its two other bedrooms, made with comfort in mind and each featuring completely different color palettes. All rooms feature Queen beds. Set between plazas, fountains, and trees, this beach flat in Plaza Carlota represents a bit of the Old World in the New World, a great home in Las Catalinas to come together after a day at the beach. Up to 8 guests can be accommodated in this Guanacaste rental and children are welcome. Embrace the comfort of a private beach apartment in a picturesque setting and experience the wonders of Costa Rica the way it’s meant to be. Enjoy the privacy of your own Guanacaste apartment with daily housekeeping service and let our dedicated concierge team help plan your dream holidays.